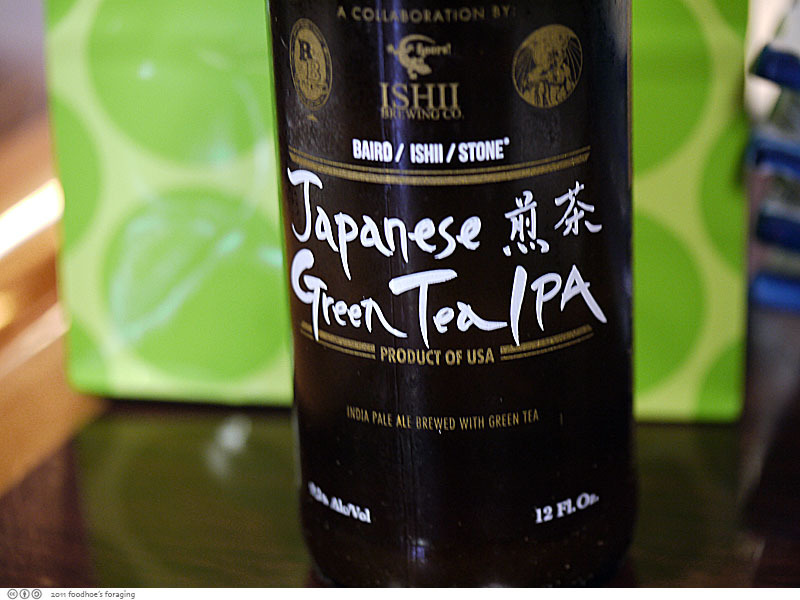 I had to try this interesting Baird / Ishii / Stone Japanese Green Tea IPA a brew created as a benefit for the Japanese tsunami relief effort. The beer is “dry-hopped” with Sencha, a variety of whole-leaf Japanese green tea! I found it to be a bit bitter, but very drinkable and paired very well with the sticky sweet spicy fried things to come. The Dry Fried Chicken Wings were as good as I remembered. The only difference is the portion is smaller, so we asked for a double order, which was still smaller than a regular order at San Tung… It is the cooking technique which gives the chicken that amazing texture: double frying. This same technique that is used for perfect french fries, double-frying ensures that the chicken is cooked properly in the first stage and then achives the perfectly crisped skin by rendering out all the subcutaneous fat in the second round. 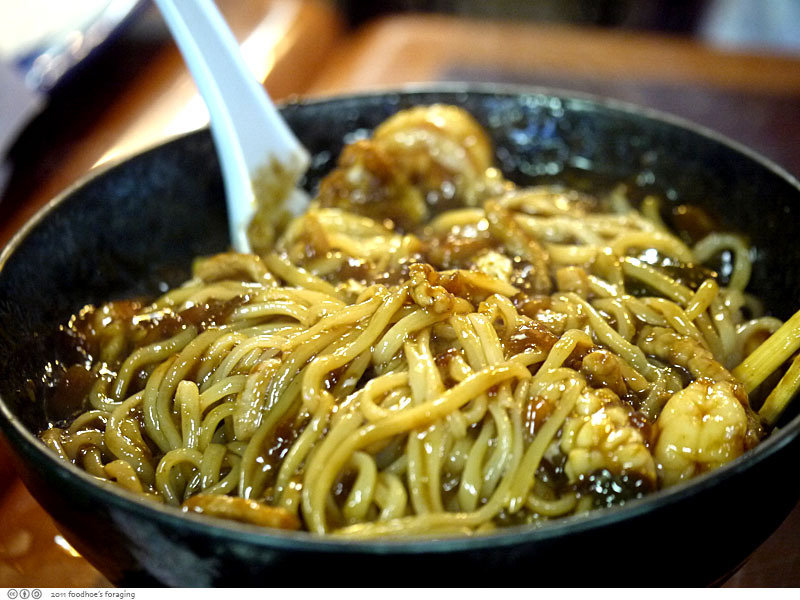 Then it is tossed with a fragrant sauce made with soy, ginger, honey and chili paste. 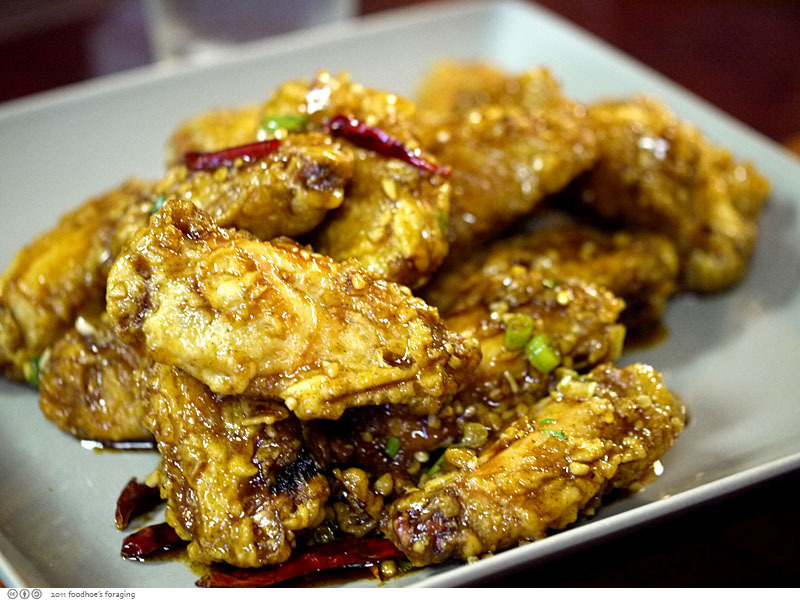 The result is a marvelous combination of flavor and texture: crisp and juicy on the inside, and covered with a sticky glaze that is savory-sweet, garlicky and spicy that is hard to resist. 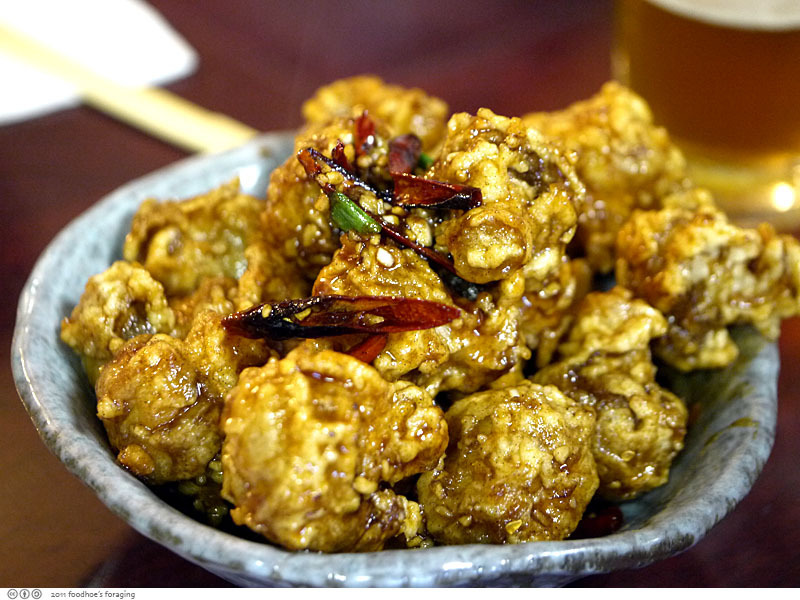 The same treatment is given to the Fried Mushrooms, whole button mushrooms that spurt dangerously hot juices when you first bite into them. JT mixed it up thoroughly, exposing lots of plump shrimp & pieces of calamari. 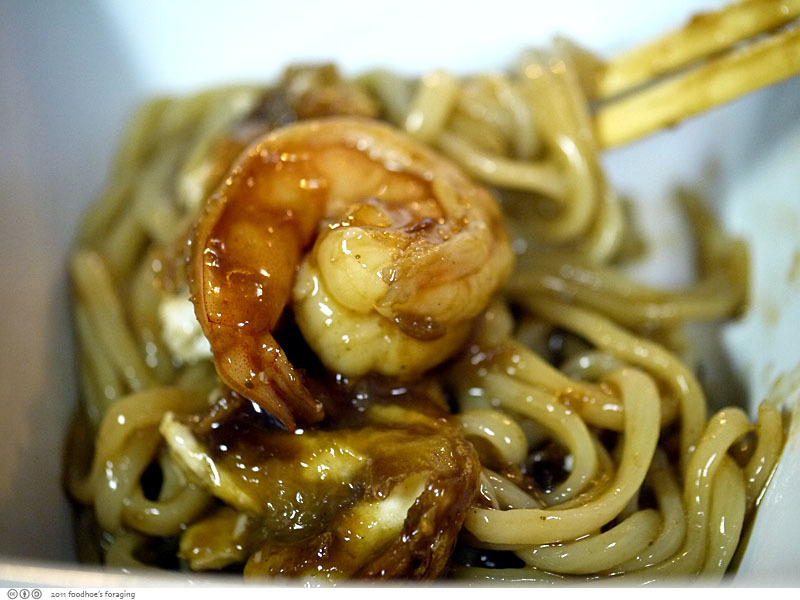 I found the dish to be addictively salty, chewy, savory, with a tinge of sweetness and couldn’t get enough of those noodles. 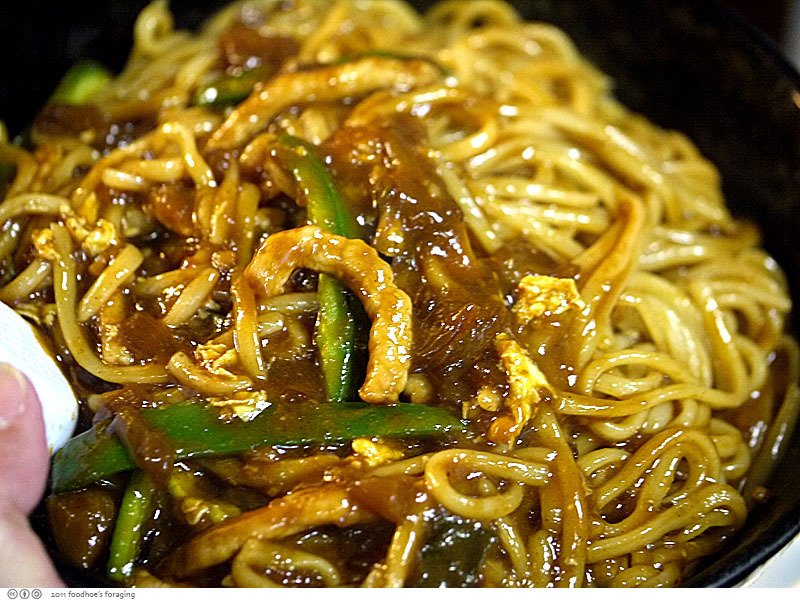 We also ordered the SO black bean sauce noodles, a spicy black bean sauce with pork, scrambled eggs, jalapenos, cayenne, and paprika. P, who is Thai and has an incredible tolerance for spicy, took one bite and proclaimed it pretty spicy, so I suggest that you proceed with caution. I took a tiny bite and it was like a mushroom cloud of heat that suffused my mouth. This was way out of my comfort zone, so I stuck with the other noodles. 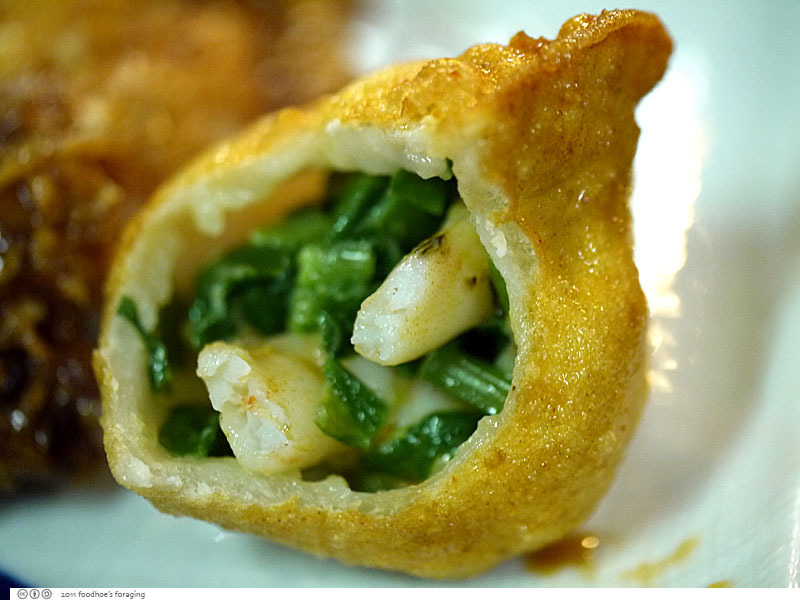 Fried Shrimp Dumplings, nine fried dumplings filled with a savory mixture of ginger and garlic infused ground shrimp and chinese chives. I think I prefer these steamed, but the fried versions were pretty dang delicious too. 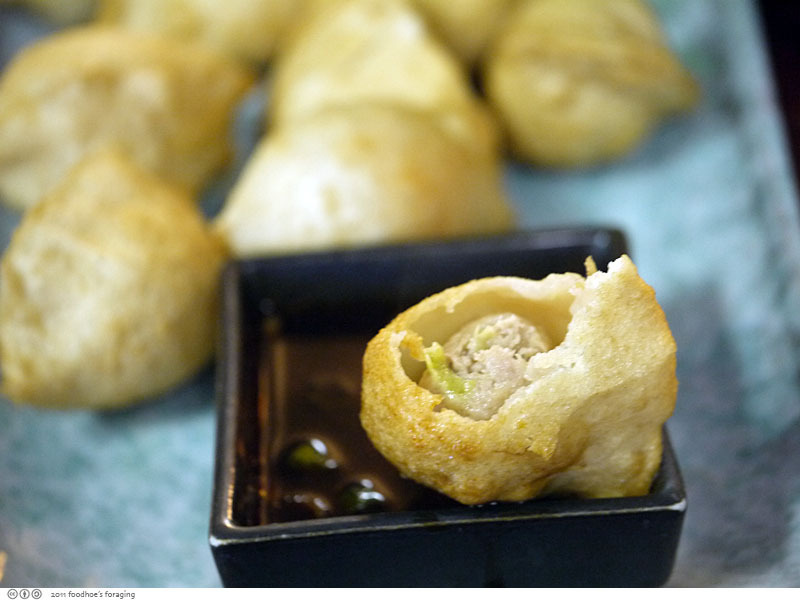 Fried Pork Dumplings, dumplings filled with ground pork and napa cabbage delicately seasoned with fresh ginger and garlic. Both dumplings were served with a spicy vinegar-soy dipping sauce, which helped balance the friedness. 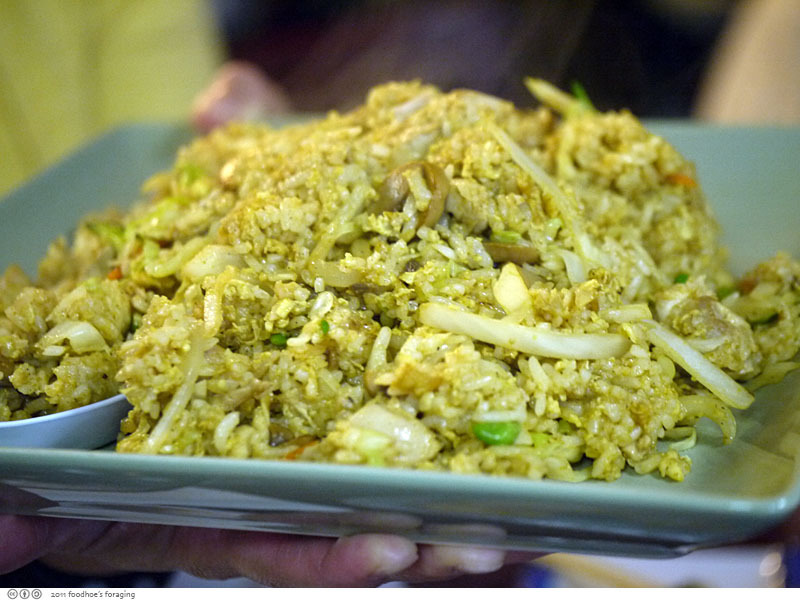 Curry Fried Rice (Veg) all fried rice includes eggs, peas, mushrooms, cabbage, carrots, onions, and zucchini. Fried rice is pretty fantastic, and it becomes otherworldly delicious when fragrant curry is stirred into the mix. Scrumptious dishes! 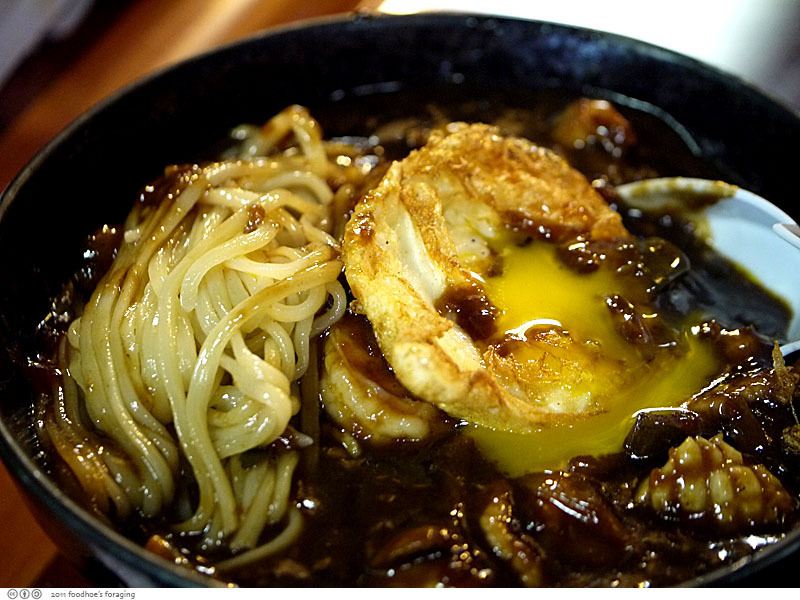 The noodles and deep-fried chicken wings look particularly good. That’s right around me! Can’t wait to try this place! Yes I haven’t met a Chicken Wing that I don’t love! How did I not know about this?? I LOVE san Tung, had no idea they had a little satellite site. Must get down here. The photos are soo sharp it looks like the food are just right in front of me waiting to be eaten. The fried shrimp dumpling here’s yummy! And the fried mushroom and the fried chicken wings. WHAT? 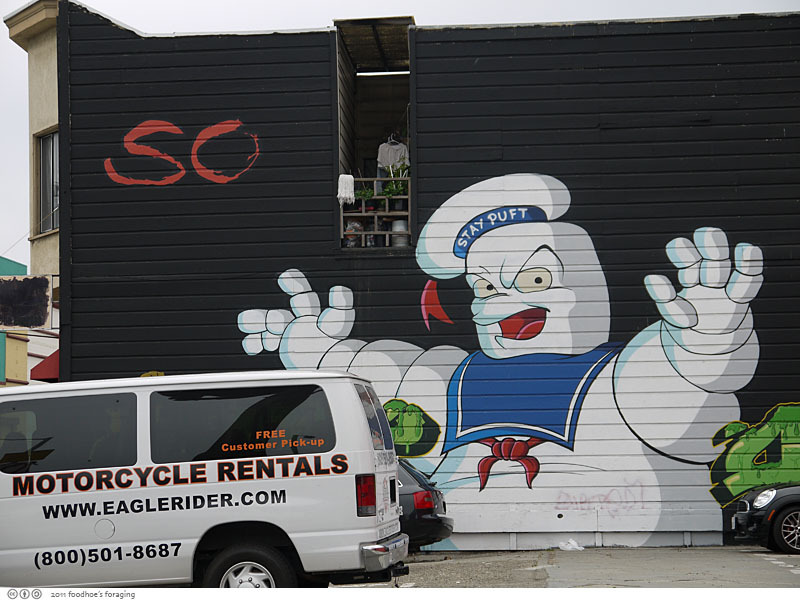 A new San Tung site in SF?! I can always count on you to identify new spots in SF worth visiting! 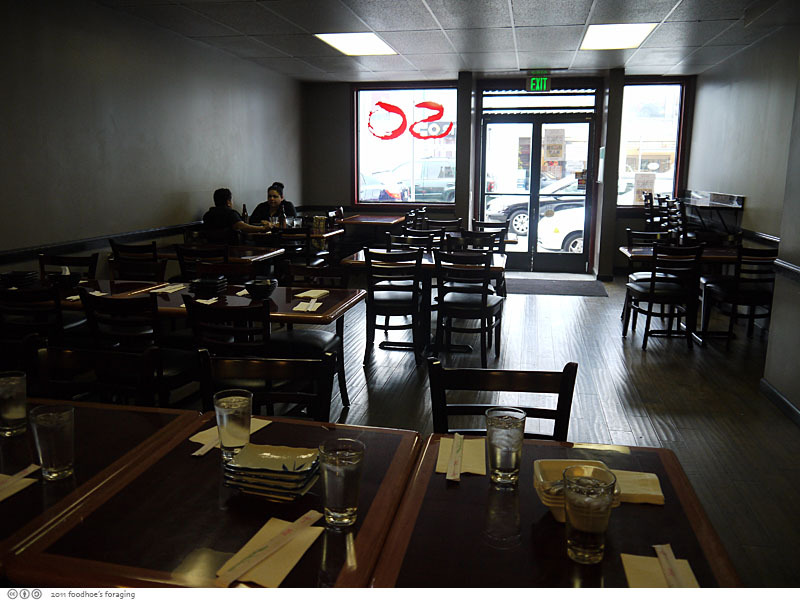 From the looks of it, you can easily get a seat at SO, where you often have to wait 30 mins+ for a table at San Tung. Thanks for the awesome tip! I am totally going here on my next trip to The Bay! Say you’ll join me for some fried chicken? @cookie, If you love chicken wings give this buffalo chicken dip recipe a whirl. Not sure if you San Franciscans not sure if you can get your hands on Rooties and Franks but you can try! Heading out your way next week for wine country all the way from Buffalo.